Nothing in the House: Nothing-in-the-House First Annual Gift Guide! Nothing-in-the-House First Annual Gift Guide! I know I still haven't posted about our Thanksgiving pies (though you can see some pictures of the day on the host MAV's blog here), but I've been admiring holiday gift-guides out there in the blogosphere-- Lottie and Doof, Tomboy Style, and Well Spent to name a few-- and thought the pie blog should have one too. Here's Nothing-in-the-House first annual gift guide--for the pie baker on your list. 1. 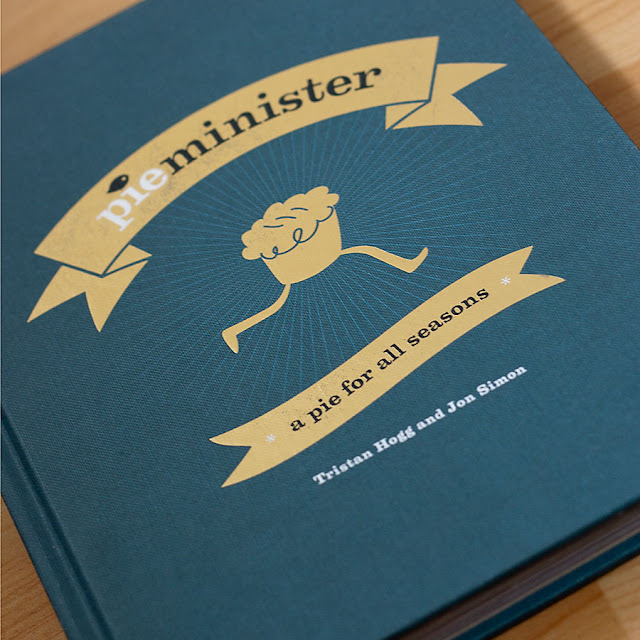 Pieminister cookbook by Tristan Hogg and Jon Simon, $22. I discovered this new cookbook when perusing the fine selections at Rabelais cookbook store in Portland, ME. The authors, Tristan and Jon, started a small pie shop in Bristol, England in 2003. 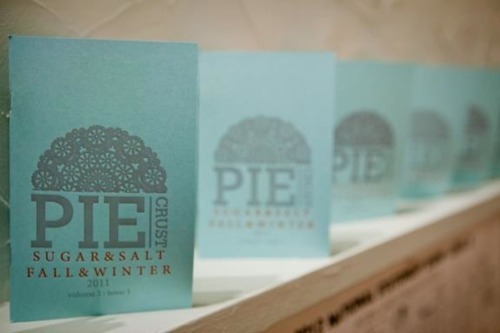 Their company has since exploded, and pieminister now has multiple shops and sells at markets across the UK. I've been exploring British pies (which may mean having to start eating meat?!) lately, and this book is on the top of my own Christmas list. 2. Bike Basket Pies Recipe Booklet by Natalie Galatzer, $12. I found out about Bike Basket Pies simultaneously--from my friend Valeda in San Francisco, and when Nothing-in-the-House joined Twitter (follow us here @housepie!). 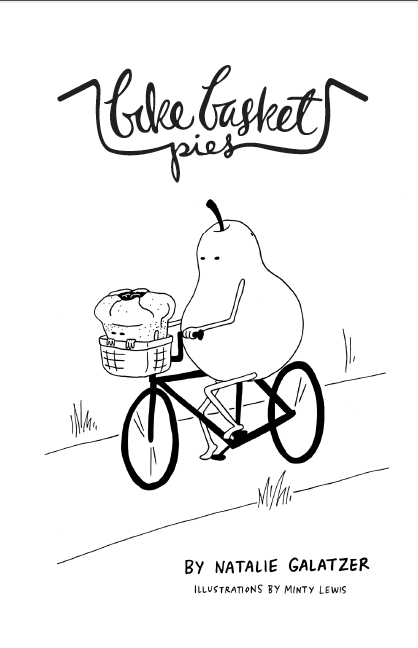 Though Natalie has since moved on from her bike-delivered pie company, she wrote this adorable pie recipe booklet to commemorate her two year run. I can't wait to get mine in the mail, and we'll be featuring an interview with her here soon. 3. PIECRUST Magazine: Sugar & Salt, $7. You may have read our interview with PIECRUST's founders Megan Collins and Lauren Cardenas a few weeks ago. Though the content of their handmade letter pressed literary and art magazine is not limited to pie, they use pie crust as a concept-- a foundation for creativity. Keep up to date with news about future issues here. 4. 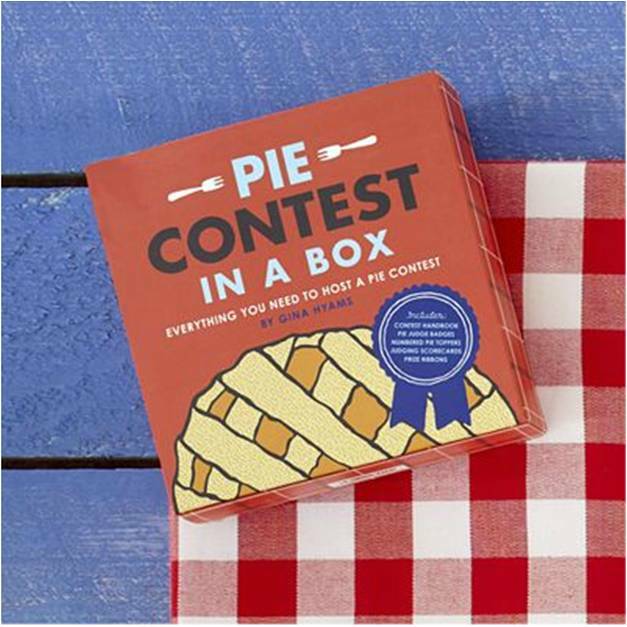 Pie Contest In A Box, by Gina Hyams, $9. Gina, the author and creator of Pie Contest In A Box contacted me through her delicious pie site, Pie Takes the Cake . She asked if she could do an interview with me about the pie blog, AND asked if she could send me a promo copy of the Pie Contest-- yes, please! Though I am more into communal baking than competitive baking, this would be a great way to get kids or your friends into pie-- and this box provides everything you need, from ribbons, to scorecards, to labelling flags, and a cute hand book full of interesting pie tidbits. 5. 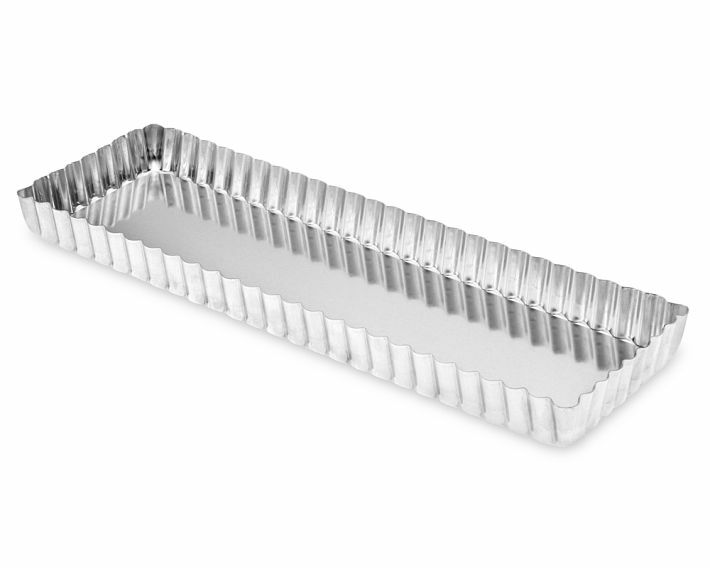 Rectangular tart pans, $9-$18. I'd been seeing a lot of beautiful rectangular tarts all over the food blogosphere (here, here, and here are a few examples). So I ordered some on Amazon (and tried them out with this ginger lemon & bourbon orange tart a few weeks ago) but lots of companies seem to be riding this tart trend--the one pictured is from Wiliams-Sonoma. 6. Pastry scraper, $2-$10. My housemate and fellow Tart Kari (of Tarts by Tarts and Tanglewood Baked Goods) has a pastry scraper in our baking drawer, and it's become one of my favorite tools of the kitchen--I'm not sure how I managed without it before. 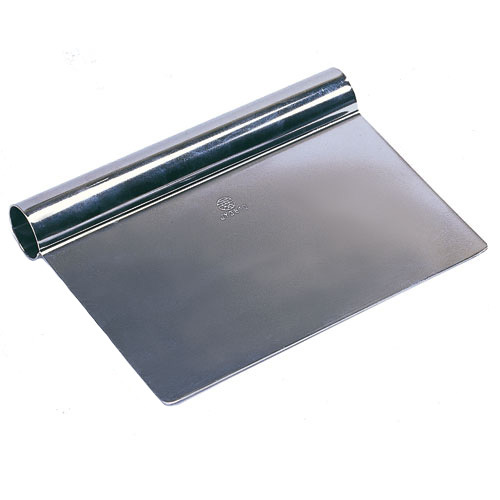 Great for chopping pastry, positioning crust, and scraping dough off of counter tops. An must-have for the pie baker on your list--the one pictured from Chef Tools. 7. 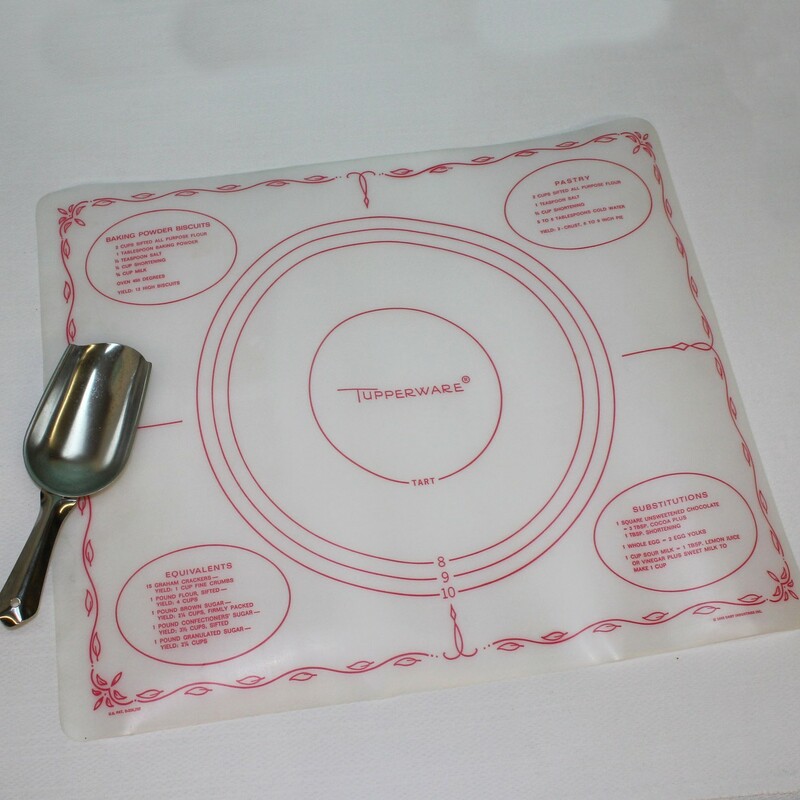 Vintage Tupperware pastry mat, $9-$20. Nothing really says pie baking to me like this era Tupperware rolling mat. My mom and grandma both have them and always use them to roll out any dough that needs a-rollin', be it crust, biscuits, or cookies. Though any mat will do the trick-- providing a clean work surface and crust-size guidance-- I'm partial to this one for mainly nostalgic reasons. I got mine from a friend, but they are available on Etsy, Ebay, and likely your local thrift or vintage shop. 8. Herriott Grace hand-turned cherry rolling pin, $70-$80. Yes, alright, that's a lot for a rolling pin, and granted, mine was a very very sweet and unexpected gift from my dear friend. But hear me out. Herriott Grace is the company of Nikole and Lance Herriott, a father-daughter team who live 3,400 km apart from each other. After years of Lance sending his daughter hand-carved spoons in the mail, they decided to launch their small business. 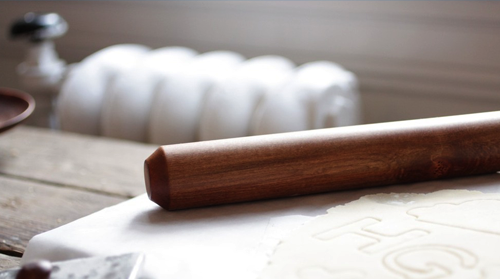 More functional art than ordinary kitchen tool, this rolling pin is beautiful solid cherry, has a heavy weight, great feel, and will last forever. 9. 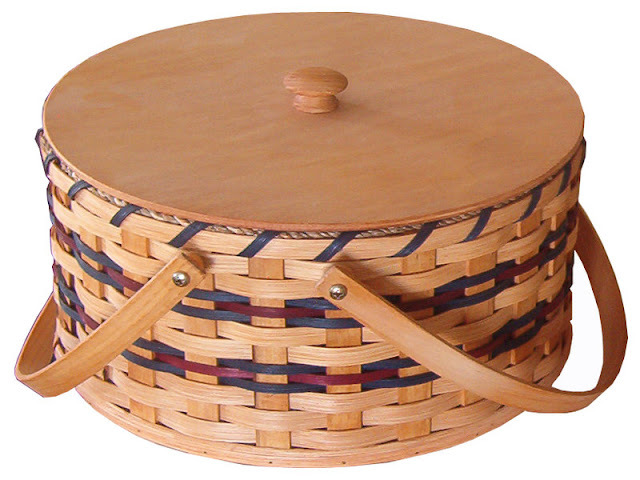 Double-decker Amish pie carrying basket, $45-$70. My parents got me one for Christmas a few years ago from our local Amish market and it is one of my favorite things I own (mine is very similar, pictured here). Perfect for carrying not just one but TWO pies (or other dishes) to a potluck or party--there's a tray that fits inside so you can stack them. Beautiful crafted--mine is signed by the woman who made it-- Loretta Miller. 10. Measurement poster by Hatch Show Print, $12. Last on our list is this very useful letter-pressed poster by Nashville's famous Hatch Show Print, available in black online and in an array of color at their shop. 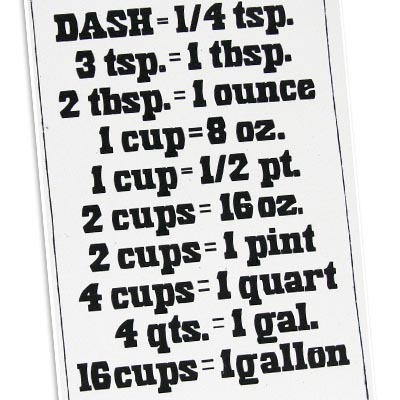 With its list of useful measurement conversions, its perfect for any baker's kitchen. Just need to get mine framed (its light blue) and it will be hanging next to our sink. Hope you can find something useful for your favorite pie baker, or to put on your own list! And never underestimate the power of a gift you make yourself...even pie bakers like to get a homemade pie sometimes! my herriott grace rolling pin has only gotten prettier with use, and the bike basket pies zine is really awesome - i think you'll agree. thanks valeda! i love my rolling pin too...and can't wait for the zine!